This 1:10,000 scale (1.5 x vertical exaggeration) 3D model of part of the Mau Complex covers a total land area of 52,800 ha or 528 km2 and includes parts of the Nakuru and Narok Districts in Kenya. 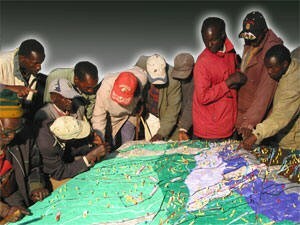 This is the 1st Participatory 3D Model ever done in Africa. It was completed in August 2006. The exercise has been made possible by the coordinated effort made by the Ogiek Peoples, ERMIS-Africa, the Technical Centre for Agricultural and Rural Cooperation (CTA), the Indigenous Peoples of Africa Coordinating Committee (IPACC), the Gaia Foundation-UK and the Nessuit Primary School. 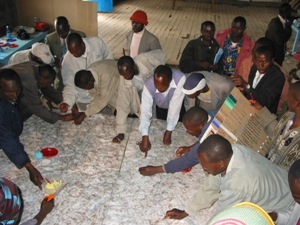 The exercise – which has been a step in a long lasting process initiated by the Ogiek Peoples to regain their cultural identity and lost ancestral territories (see case) – has stimulated community cohesion, surfaced lost memories on the environment and traditional ways of living as hunter-gatherers, facilitated inter-generational knowledge exchange and raised awareness on the critical status of the entire Mau Complex in terms of depleted forest cover and affected watershed functions. The elders concluded that they have now a more holistic understanding of their social, cultural and bio-physical environments. They will confer among themselves to define the best way forward in terms of improving the safeguarding of their traditional knowledge, the sustainable management of natural resources and advocacy actions aimed at regaining recognitions of their ancestral rights. Depicted data reflect the mental maps of approximately 120 Ogiek Peoples from the 21 clans. Elders populated the model with their memories dating back to 1925 and reconstructed the landscape as it was at that time. The model displayed 64 data layers including different types of areas, points and lines. The blank model has been constructed by 30 students and 5 teachers from the Nessuit School and with the assistance of a total of 12 facilitators and trainees. In 2007 the model was expanded to include additional 290 km2 and specifically portions of the Njoro Watershed. The Ogiek were involved in a series of P3DM exercises (e.g. Mount Elgon) all related to their quest for asserting their traditional rights on their ancestral lands. 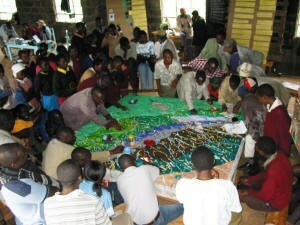 In 2006 a little known ethnic group – called the Ogiek – created a three-dimensional map of their ancestral land in Kenya. In the past members of this indigenous community were regarded as second class citizen. Today, their story has gained international recognition. The Kenyan government is increasingly listening to their voice and including them in a dialogue over the future of their community and of the Mau Forest.